Now that this race has been switched to dirt, Northern Screamer (#15) becomes the likely favorite, but I’m a bit skeptical of her stepping up in class off a blowout win against much weaker competition. 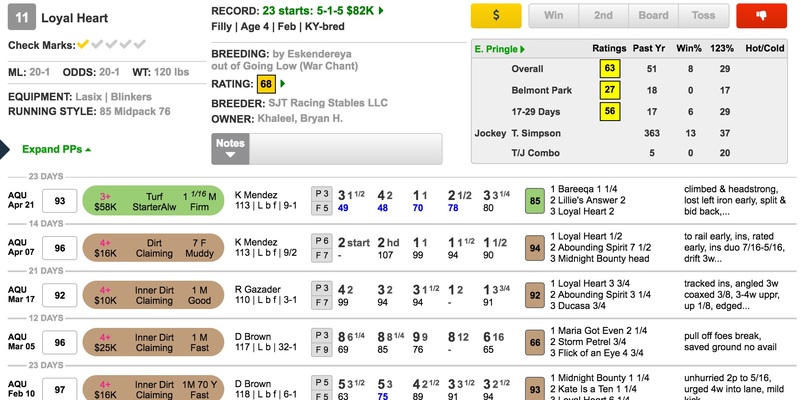 She did earn a field-best 106 TimeformUS Speed Figure for that effort, but the track was somewhat speed-favoring that day, as is indicated by the pink-colored Race Rating box in TimeformUS PPs. Any moisture left in the surface will help her, but I think she’s going to be an underlay regardless. I had picked LOYAL HEART (#11) on turf, and I’m sticking with her on dirt. She actually ran exceptionally well last time given her trip, getting restrained early before making a middle move to the lead on the backstretch. I wish her connections had named one of this circuit’s high-profile riders, but as it is, the switch to Trevor Simpson is actually mild upgrade over those who have piloted her in recent starts. Although her last race was on turf, which is probably her preferred surface, Loyal Heart proved this winter than she’s also proficient on a dirt track, especially one with some moisture in it. The runner that she defeated in her last two dirt races, Abounding Spirit, has returned to win a couple of races with improved speed figures. If this filly is going off at odds of 6-1 or greater, she’d be an overlay in this field, and I think she’s a viable alternative to the favorite.